The Coral Tree is an amazing tropical plant that is a member of the Legume family, Fabaceae. It may be spiny or smooth, deciduous or evergreen, with a spectacle of a flower in brilliant pink, red or orange hues. Coral Trees are members of the genus Erythrina and are primarily found in South Africa and South America. There are approximately 112 different species of Erythrina around the world. They are also found in Mexico, Central America, the West Indies, Asia, Australia and even Hawaii. The average height of a Coral Tree is 35 to 45 feet (10.7 to 13.7 m) tall, but some varieties exceed 60 feet (18.3 m) in height. The leaves have 3 distinct leaflets and the stems may have thorns or may be smooth, depending upon their evolutionary adaptations. The trees have a thick trunk, usually with several smaller trunks joining the main stem. Roots push out of the ground as they age and may become a hazard. The bark is a thin grayish brown and the wood is pithy and weak, prone to breaking in the wind or due to overwatering. The flowers are the standout, appearing in late winter. They are outlandish constructions of thick bright pedals standing erect around the corolla. Hummingbirds are extremely attracted to the loud colors and striking scent. Growing Coral Trees is only appropriate outdoors in USDA zones 9 and up. Coral Tree care is easy if you are in the correct region, but some growers may find them messy. Coral Trees need very little water. Too much water actually promotes a weak limb structure and subsequent breakage. Overwatering causes the tree to grow too quickly, and its soft wood cannot support such spurts. Then in the dry season, the weight of the tree can actually pull it out of the soil. Pruning the tree in spring to remove the heavier stems or any damaged material will help prevent limb loss and trees from tipping. 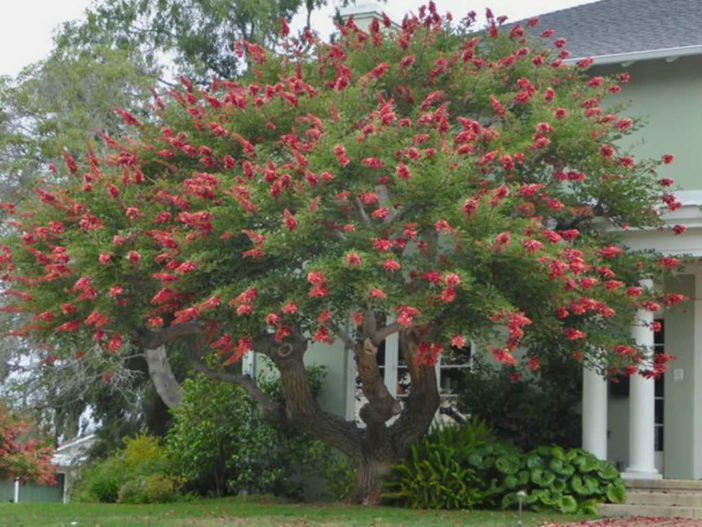 Fertilizer is also not recommended when growing Coral Trees. Fertilizer also causes them to have aggressive growth that can cause problems later. Cover over the root zone with a good organic mulch, which will gradually leach a light dose of nutrients into soil over time.